On Monday, April 16th, a van and Sport Utility Vehicle were involved in a head-on collision on the snowy streets on Spencer. The accident occurred on Route 31 South near Howe Road and 132 Charleton Road. Front and side airbags were deployed in the SUV which had extensive front end damage. The van had moderate left-side front end damage. Multiple injuries were reported and Spencer Fire and Spencer Police were on the scene. The road was closed temporarily, forcing driver’s to find different routes around the accident scene. There are no details at this time as to how the collision occurred or who the occupants were. It appears that the SUV may have veered into the oncoming traffic of the next lane and plowed into the van, according to photos of the scene. 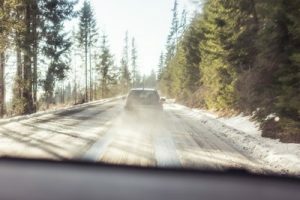 An injured party also only has 30 days in which to notify the government branch he or she believes is responsible, of the injury caused by the snow or ice on the road. A person must notify the county, city, or town of injury or damage from snow or ice on a public way within 30 days. If you have been in a car accident, and believe the snow or ice conditions on the road were unsafe and caused the accident, please contact the Law Offices of Jeffrey S. Glassman at (617) 367-2900 today to set up a consultation.